The Ford Escape 2018 Has Some Really Remarkable Interior Features | Rhinebeck Ford Inc. Interested in a compact SUV? We may have the perfect car for you: The Ford Escape 2018. A new iteration of the long-time favorite SUV, the Escape 2018 impresses in a ton of different ways. Perhaps its most remarkable feature set comes in the form of its aesthetic. The Escape features a bevy of wonderful interior options that are sure to wow even those who have found themselves bored with similar options. Below are two of our favorites. If you frequently find yourself the chauffeur for your family, friends, or their belongings, the Ford Escape 2018 may be perfect for you. With an admirable amount of its overall real-estate dedicated to storage space, the Escape can easily transport large amounts of cargo with minimal hassle. And getting the cargo inside the vehicle will be stress-free as well, as the vehicle is equipped with hands-free, foot-activated lift gates, which can make getting heavy loads into the trunk a breeze. 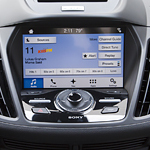 If these features sound appealing to you, don't hesitate to come to visit us at Rhinebeck Ford Inc. for a test drive.